Aeginetan stater (reverse) ca. 5th century B.C.E. Coins in ancient Greece are excellent records of the activity that surrounded them. In order to position an understanding that re-contextualizes information about numismatics the coins themselves will be the primary locus of this study—they are the primary actors. Actor-network theory (hereafter ANT) is offered as a methodology in which to research ancient Greek currency within varying contexts. Although human activity is an important part of the way we think of things, it will be decentralized here, but it will not be discounted or discarded. By way of ANT, coins will be examined in their unique relational contexts and how they have acted in these contexts as abstract ideas and physical objects under the categories of groups, actions, facts and objects. A broad historical perspective is given within these categories, to situate the birth of coinage and concluding with the Hellenistic era. A good deal of attention will be given to the birth of coins and the subtle problems that ensued as a result of their dynamic presence. Aeginetan coin design also presented an example of how mathematics and numismatics were unexpectedly linked in antiquity. The legacy of Alexander the Great stands as a high point in the ideology and reality of the quasi-mythic ruler’s influence. This issue will be considered, along with how his image was manipulated throughout the Hellenistic world after his death. This study will conclude with a question of how the agency of ancient Greek coins and their heterogeneous patterns have threaded through the networks that created them—via ANT. If anything, ANT is ontological, meaning that it focuses on the specific relational and organizational ways things interact. ANT had its beginnings in the innovative social theory of the 1980s and it was initially conceived of by Law, Latour, and Callon. In his informative paper on ANT “The social and beyond: introducing Actor-network theory”, the maritime archaeologist Dolwick wonderfully elaborates the structure of ANT. He tells that it can generally be thought of as a methodology in which to do research about actors (or actants), these actants can be persons, groups, ideas objects, plants, animals, etc. The actor is either deliberately acting with agency or having actions and ancillary agencies surrounding it “It may not necessarily be the source of action, but something that modifies a state of affairs by making a perceptible difference.” Then, there is the network, this can simultaneously be an actant, but as Dolwick describes it “[…] is an interactive assembly of actors, group, or ‘string of actions’ involving a number of potential mediators.” As Dolwick demonstrates, we can organize our research into four basic categories: groups, actions, facts and objects. Ancient Greek coins can easily be thought of as operating within in a network of groups, actions, facts and objects—henceforth our organizational format. These categorizations will be explained along the way. Fig. 1. Lydian 1/6 stater (obverse). ca. 650-600 B.C.E. electrum. The British Museum, London. Schaps argues that the coins could have been invented for a kind of official state payment to soldiers or even mercenaries, but Schaps see these uses as unlikely. As for the second possible use, Schaps suggests that the coins could have been way to guarantee the value of the electrum, since the gold to silver ratio of the alloy could vary depending on where the metal was mined. Howgego, in his book Ancient History from Coins, puts the question to rest “We know nothing about the function of the earliest coins.” If we were to readily accept Schaps second idea, that these coins were produced to guarantee the value of electrum, then the special alloy itself is determining how it is used, valued and distributed. The precious qualities of the electrum uniquely position it to be minted for whatever purpose the coins were actually made for. The quality of the metal determines its placement within its specific group. 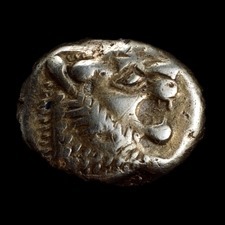 This connection includes the real need for such rare metals to be placed within their network of ancient Greek coinage. Electrum was not a secondary player within its group. Instead, it played a significant role in determining the beginning of coinage, because of its rarity and malleable qualities. Dolwick describes this category as having to do with the concept of agency, he asks “What work was required to induce two or more potentially disagreeable actors into coexisting (perhaps even acting together)?” Coins transformed the way people negotiated with their world and they repositioned antiquated ways of exchange. Tordoff, in his remarkable paper “Coins, money, and exchange in Aristophanes’ Wealth”, writes about such transformations. Before the rise of capitalist markets, pre-capitalist reciprocal social exchanges were not clear cut. For example, “[i]n the context of close relationships, reciprocal exchanges may only be completed over a long period of time.” This means that the value exchanges between family or close friends were negotiated in a different, long term way than those of our current capitalist model. Then Tordoff counters this with “By contrast, in the context of the market, where social distance is great, the exchange on the spot of items of equal value will be the norm.” The difference here has to do with a long established pre-monetary way of exchanging things vs. a monetary way of making an exchange, whereby “[…] within the community of the village, bonds of kinship and morality make this sort of activity fundamentally unacceptable.” Tordoff suggests that since the practices of exchange were morally questionable, money would be “cooked.” Presumably, if a fisherman wanted to use the money he earned by fishing, he would give it to his wife, who would use it for the household in a less explicit way than a simple quid pro quo transaction. We could think of this as a kind of domesticated soft money, whereby the edges of direct exchange became blurry, less matter-of-fact and more socially acceptable. This shows us that money just wasn’t as we view it today. Actually, coins were distrusted. It should go without saying, but it is worth repeating, the advent of coinage changed the traditional ways in which things were exchanged. Tordoff writes that coins were looked at with suspicion and hostility because money was “[…] a new medium of exchange that threatened the old established practices of reciprocal gift giving […]” The resistance to this new form of exchange basically sped up the exchange process and it also deflated long traditions of aristocratic gift giving. People used coins in an exchange that quickly became more democratic and equalizing. In these examples it becomes clear that the human actors, in their new found connection to the coin actors, had to measurably adjust and accommodate their ways of dealing with the world. These small valuations of metal have changed people’s relationship to exchange and commerce by streamlining the process. Coins and people are causally linked. Their actions were once new and suspicious. Nowadays we no longer question their place because their agency has been fixed and placed within our capitalist network. Haselgrove and Krmnicek in their thorough and fascinating essay “The archaeology of money” write that “as artifacts, coins and other kinds of currency are an integral part of the archaeological record.” But they show that the study of numismatics can easily become divorced from its context through the course of history. Coins become isolated agents that seem to act in the predictable ways we understand them, yet we cannot let this view obscure the past. Our perception of monetary patterns in the ancient world does not always apply to the way it actually was. The authors remind us that coins are a unique record of the past, coins can be thought of as a kind of fossil record that becomes an illustration of the ancient past. Haselgrove and Krmnicek also mention the invention of coinage that corresponded to the use of the alloy of electrum, some of their attention is on the archaeological find of one of the largest hordes of electrum coins, that was found somewhere beneath the Temple of Artemis at Ephesus in modern day Turkey. This shows that our relationship to the past can easily change depending on how good (or bad) the archaeology is. There could be more hordes of coins to be found elsewhere and whenever a significant find comes to the surface, it could, and usually does, change our sense of the past, even if it’s just a little. Our understanding of the network of the ancient world can change with every new find, thus, the newly excavated coins and their particular agency could easily reposition the existing historical record, depending on how exceptional, rare or valuable the find actually turns out to be. The factors that include value, both past and present, can be thought of as an agency the coins deploy and this value ‘causes’ any of the activity surrounding around them. In other words, because of the intrinsic material, historical, and cultural value of the coins, archaeologists must respect their finds by classifying, identifying, and preserving the artifacts. This is the agency and the network of the ancient coins, whereby the artifacts (the coins) are, more or less, dictating how they will be treated and respected by the archaeologists and others. This category is somewhat difficult to place and to help us understand it, Dolwick asks “So, in the actor’s accounts, which facts were being disputed and made matters of concern?” This category is not only about the facts themselves, but it is also about how those facts were getting repositioned and questioned within their ever changing networks. Ancient Aeginetan coin design presents an intricate example of this, whereby mathematics and numismatics become unexpectedly linked and questioned. The dispute Dolwick speaks of is basically a question of incommensurability. The Stanford Encyclopedia of Philosophy defines incommensurable as such “the term ‘incommensurable’ means ‘no common measure’, having its origins in ancient Greek mathematics, where it meant no common measure between magnitudes.” In his paper “Pre-Euclidian geometry and Aeginetan coin design: some further remarks.” Ambrosi presents the idea that ancient Greek coins from the island of Aegina depict specific geometric designs that predate Euclid’s description of ‘doubling the square’. 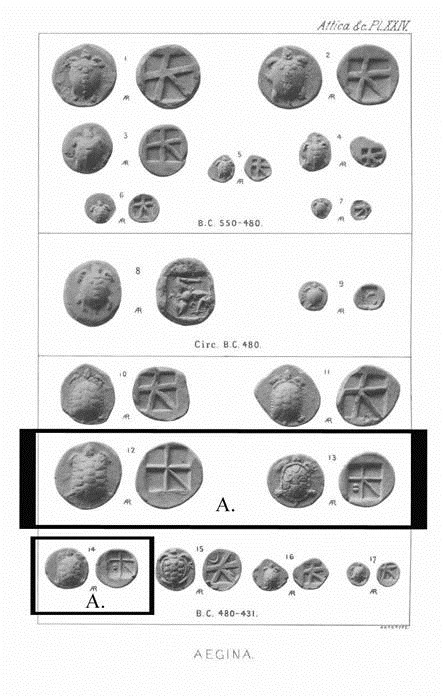 The early geometric designs on the coins from 500 B.C.E. seem to conceal incommensurability, while later Aeginetan 400 B.C.E. coins reveal irrational numbers (re: √2) which also relate to complex philosophical and cosmological issues of Pythagoras, Euclid, Aristotle, Plato and Heraclitus. Aeginetan coins with these geometric designs were widely used throughout ancient Greece. Although, little is known about why the geometric designs were imprinted on the Aeginetan coins, Ambrosi claims that when we do the math, the early designs conceal important mathematical problems. This is because the ancient Greeks had not yet come to terms with incommensurability, which could have its origins in early Pythagorean secrecy. Ambrosi indicates that later editions of the coins show the geometry clearly, and this coincides with the acceptance in Greek intellectual circles with of the concept of incommensurability (see Fig. 2). Ambrosi concludes by noting that the mathematical design on these coins would have been understood by the ancient (intellectual) Greeks. Much can be discussed about the mathematics of the coins, but we still cannot be sure about the actual motivations behind the designs. Fig. 2. The Aeginetan coins (boldly outlined, marked with A.) show the geometric design on the reverse of the coins as un-obscured, most of the other coins show the geometric design as obscured (including some of the later examples, this might indicate that these examples are older, even though some of them are grouped in the 480-431 B.C.E. timeframe). The way this last category is described by Dolwick seems to fit the idea of coinage perfectly “[…] far from being the mere hapless bearers of symbolic projection, objects (things) have the potential to exist within their own little webs of materialized relations […]” This is the part of ANT where the so called ‘non-human’ actors are important. With coins this point is made obvious via how the elaborate political networks of the ancient world used coinage. 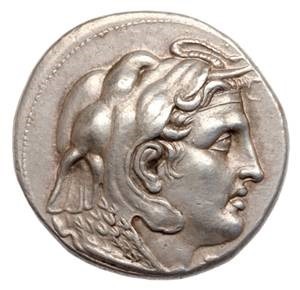 The legacy of Alexander the Great stands as a high point in the ideology of the quasi-mythic ruler’s portrait on a wide variety of coins throughout the Hellenistic world, including Ptolemaic Egypt. François de Callataÿ in his essay “The fabulous wealth of the Hellenistic kings: coinage and Weltmachpolitik,” writes that Ptolemy I Soter “[…] was the first to place Alexander’s image on coins.” This peculiar fact places all the coinage with Alexander’s image as post mortem. De Callataÿ reminds us that “[a]lthough Alexander adopted […] an ancient coin type without the intention of being identified with Heracles, his portrait was evident on it in antiquity.” This means that any of the portrait images on all the coins minted in Alexander’s lifetime, are only suggestive of him as a god, but they are not actually portraits of him. In his book Dahman (mentioned earlier) brings up the issue of Ptolemy I Soter’s usage of Alexander’s image on coins, in a slightly different way “the purpose here is not really to portray as an individual, but rather to exploit his legend and ideological potential […]” Ptolemy I Soter was keying into the legend of the great leader and the coins became a physical manifestation of that desire. The coins are the non-human place where the idealization becomes a reality. A man’s face on a small piece of metal becomes the medium and tangible artifact of his legacy—the coins are intrinsically a part of his oversized identity and idealization. Fig. 3. Tetradrachm of Ptolemy I Soter, (obverse) ca. 323-305 B.C.E. silver. Showing a fine portrait of Alexander the Great with an elephant skin helmet. The Fitzwilliam Museum. The blending of abstract and physical circumstances in which we can ask about the action, distribution and placement of coins in ancient Greece offers a rich, albeit incomplete, area of study. To call this a conclusion suggests that we have accomplished all that we have set out to do. This is far from the truth. Our work is not done. However, we can conclude that coins did not operate in their specific networks in predictable ways. From the earliest invention of coins in modern day Turkey, to the Hellenistic kingdom of Ptolemy I Soter, coins have shown themselves to be actively transforming the actions around them. As much as we want to place humans at the center of everything, ANT shows us that objects, such as coins, can decentralize our sense of value and our understanding of the very networks they have created. Ambrosi, G.M. 2012. “Pre-Euclidian geometry and Aegintan coin design: some further remarks.” Archive for History and Exact Sciences 66:557-583. Dahmen, K. 2007. The Legend of Alexander the Great on Greek and Roman Coins. New York: Routledge. De Callataÿ, François. 2012. “The fabulous wealth of the Hellenistic kings: coinage and Weltmachpolitik.” Words and Coins from Ancient Greece to Byzantium, 91-101. Ghent: MER Paper Kusthalle. Dolwick, J.S. 2009. “’The social’ and beyond: introducing Actor-Network Theory.” Journal of Maritime Archaeology 4: 21-49. Haselgrove, C. S. Krmnicek. 2012. “The archaeology of money.” Annual Review of Anthropology 41: 235-50. Howgego, Christopher, 1995. Ancient History from Coins. New York: Routledge. Law, John, John Hassard, eds. 1999. Actor Network Theory and After. Oxford: Blackwell. Oberheim, Eric and Hoyningen-Huene, Paul. 2013. “The Incommensurability of Scientific Theories.” The Stanford Encyclopedia of Philosophy. http://plato.stanford.edu/archives/spr2013/entries/incommensurability/ . “Ontology.” 2006. The Oxford Companion to Philosophy, 670. New York, NY: Oxford. Sayles, Wayne G. 1997. Ancient Coin Collecting II: Numismatic Art of the Greek World. Iola: Krause Publications. Schaps, David M. 2004. The Invention of Coinage and the Monetization of Ancient Greece. Ann Arbor: University of Michigan Press. Tondoff, R.C. 2012. “Coins, money and exchange in Aristophanes’ Wealth.” Transactions of the American Philological Association 142 (2): 257-293. Haselgraove and Krmnicek define numismatics as: “the academic study of coins, medals and related monetary objects.” 2012, 236. Ontology usually has to do with being, and with special consideration given to the origins of being, but when we consult The Oxford Companion to Philosophy it indicates that “Different systems of ontology propose alternative categorical schemes” The Oxford Companion to Philosophy 2006, 670. John Law helps to summarize this material-semiotic approach “There is semiotic relationality (it’s a network whose elements define and shape one another), heterogeneity (there are different kinds of actors, human and otherwise), and materiality (stuff is there aplenty, not just “the social”). There is an insistence on process and its precariousness (all elements need to play their part moment by moment or it all comes unstuck). There is attention to power as an effect (it is a function of network configuration and in particular the creation of immutable mobiles), to space and to scale (how it is that networks extend themselves and translate distant actors).” Law 1999, 1-14. Haselgrove and Krmnicek 2012, 236.